Therefore, the project is not about the “new Minna”. 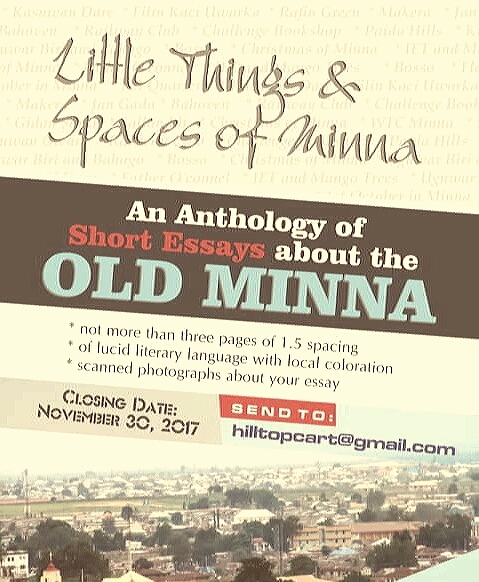 It is only looking for stories about historic locations within Minna such as Kasuwan dare, Filin kaci uwarka, Rafin green, Kasuwan mula, Jan gada, Makera, Paida and the hills, Bahoven, Bosso, Fatima college, 123 quarters, Mami market, Railway club, Railway traders, Hawan Eidi a gidan sarki among several others. The creative angles of these essays should be a recasting of the innocence of the town of Minna and the laces of old that have disappeared, making young people unaware of the nature of old Minna. These essays are meant to preserve those unique things about Minna for future. The book shall tell the story of Minna to tourists and guests and shall be handy in entertaining residents and visitors while also serving as a ready souvenir for the government to use and pop up the capital city of Minna. It will be soft, readable and easily digestible to all ages. Contributions to this vibrant project are welcomed from everyone irrespective of tribes, religion or gender. They can come from Igbo, Nupe, Gwari, Gbagyi, Yoruba, Tivs, Hausas or foreigners who have lived or still live in Minna. This is a universal call to everyone in the world that has a story to tell about Minna. Old pictures of old Minna are especially desired. Submission closes on November 30, 2017. All accepted submissions would be published by the first quarter of 2018. His royal highness, the Emir of Minna is expected to participate in the project.